Sometimes it’s hard to know what you should be paid, especially when you are literally in a foreign marketplace. I often work with people looking for career advancement, a new job opportunity, or, hardest of all, a way back into the workplace. My clients are mature, well rounded people and they know money is not everything. The rewards of work go way deeper than the pay check. But they do want to be paid what they are worth; we all want to be paid a decent wage for our commitment to our employers and so I’ve compiled a list of a few websites to help you understand some norms and patterns in Dutch salaries. First a word about expat pay. There are some expat employment packages that include the 30% tax ruling for highly skilled knowledge migrants. Indeed I came the the Netherlands on just such a deal many years ago. These packages can also include payment of the rental costs of your apartment, and your childrens’ international school fees, as well as other perks. It sounds like an ideal situation, but its worth remembering should you think about looking for another position that sometimes the perks connected to a job can become chains that bind you too. So if you are thinking about changing roles to a position with no expat perks its useful to have the facts about Dutch salaries at your fingertips. 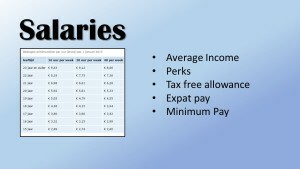 Setting the expat employment package aside lets look at Dutch pay rates. In 2012 the average income in the Netherlands was reported as € 33.000 according to figures taken from http://gemiddeldgezien.nl/geld/gemiddelde-salaris. To be honest this is a median figure as the range of salaries is so great, taken from people on minimum pay up to the few who top the salary scale. A list that includes CEO’s of international corporations and football players. To understand the average income figure further we need to know a little about the dutch education system and how school leavers become qualified for different types of work. At 12 years old all school children are streamed into one of three diploma types. These diplomas are VMBO, HAVO and VWO. Around 60% of school leavers graduate with a VMBO diploma at the age for 16, and go on to a practical training (MBO) which allows them to begin work with a professional training certificate. Around 20% gain a HAVO diploma at around 17 years old, and take college courses which lead to a HBO diploma or Bachelors degree. The final 20% leave school at 18 years old with a VWO diploma and enter university to study to at least Masters degree level. Starting salaries vary, of course, but an MBO starter in the technical sector can expect a monthly salary of between €1,500 and €1,800 gross; a HBO’er entering the commercial sector can expect a monthly salary of between €2,300 to €2,500; and a someone leaving university with a Masters degree could probably start by earning around the €2,500 to €2,800 gross. In the Netherlands you are legally allowed to work in certain jobs from the age of 15. The dutch government set a legal minimum pay level which rises with age every year from then until you are 23 years old. At this age you reach the highest grade in the minimum pay scale; €9,63 per hour for a 36 hour week, or €1,501.80 per month for a full working month. Minimum pay is known as minimum loon in the Netherlands. You can find the minimum pay scale tables on this government websitehttp://www.rijksoverheid.nl/onderwerpen/minimumloon. Minimum pay is the basic pay you can expect before extras like shift allowance, sales bonus, weekend work allowance, etc are added. You may think that because these rates are set by the government that employees would be protected from exploitative employers, but that is not always the case. My teenaged daughters friends can testify to this fact. One of them, working as a shop assistant in one of a national chain department stores was let go from her Saturday job when she turned 17 years old and her pay was due to rise from €2,99 per hour to €3,42 per hour. That particular store only employs 15 and 16 year olds as Saturday staff in order to keep the costs down. So now with all these facts at your fingertips, maybe you would like to check whether your salary is in line with others here in the Netherlands. There are a lot of websites offering this information, but I found this one to be very useful:http://www.loonwijzer.nl/home/salaris/salarischeck. Feel free to comment on your findings or any other aspects of this article!